BookLust: "We all fight our own private wars." "We all fight our own private wars." Guys, this book. It is so, so good. 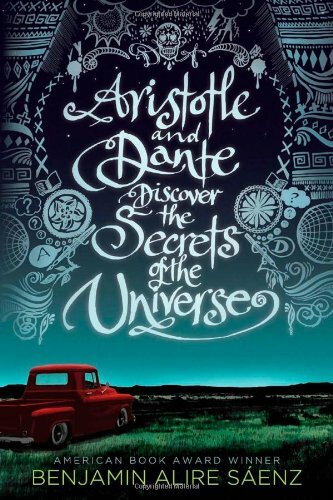 Aristotle and Dante Discover the Secrets of the Universe, by Benjamin Alire Saenz, has such a glorious title and a beautiful cover, and it DELIVERS the fantastic story that both of these promise. Aristotle (Ari) is a 15-year-old living in El Paso, TX in 1987. He is angry a lot of the time. His father is a Vietnam veteran and still has horrible memories of the war. His mom is a sweetheart but never wants to talk about Ari's brother, who has been in prison for 11 years. It's hot, it's summer, and he doesn't have any friends. Ari goes to the pool but doesn't know how to swim. Another guy there, Dante, offers to teach him. Ari and Dante become best friends, though the two are polar opposites. Dante wears his heart on his sleeve and seems happy and well-adjusted all the time. Ari is an introvert; even readers, who spend the entirety of the book in his mind, get no access to his innermost feelings and what drives him to do the things he does. As the story progresses, Dante's feelings for Ari develop into something deeper than friendship, and both Dante and Ari must come to terms with that. I loved this book so much. Saenz packed so many beautiful moments and relationships in here. Ari and Dante both deal with being Mexican-American, though neither of them fit the stereotype of Mexican-Americans. They are both 15-year-olds coming of age, too, and deal with the whole "threshold to adulthood" thing that all of us have gone through and that people will continue to go through for ages and ages. Ari has a lot of family stuff to deal with - an uncommunicative dad, a brother no one will talk about, an over-protective mother. Ari also is so angry and lonely inside, and it's hard for anyone to understand why, including Ari himself. And the way Ari and Dante play off each other and grow and stay such strong friends through so much, was so wonderful. The dialogue between the two of them is so fun. They enjoy each other's company, they are quick-witted, they talk about big things and small, and they drift away and back towards each other over the course of a few years in this book. I loved the emphasis on family, and just how supportive family can be when you are going through a really rough patch. There is one line from Ari's mom near the end that just set me over the edge because she is SO KIND and wonderful, and you can just see all of Ari's walls and defenses slowly beginning to crumble, and it's because his parents are just so loving and fantastic. And Dante's parents are just the same. This book is not just about Ari and Dante, it's about two families. Every character gets so much care and attention, and the insights that come from all of them are just wonderful. Saenz packed so much into this book and I've barely scratched the surface because I don't want to ruin the discovery for you. So much is left unsaid (mostly because of Ari's repressed narrative style), but as you progress in the story, it just blooms into this majestic story, and then you feel ALL OF THE FEELINGS. I think I've been fairly inarticulate here, but hopefully my gushing has made you want to go out and read this book. Personally, I plan to read everything Saenz has written because the man can write. A beautiful story on so many levels - highly recommended. I'm so glad to know you loved this one! It's definitely an additional push to try it out myself! I found Ari overly dramatic and kind of irritating all the way through. That may be partly because I found this as an audiobook at the library, and so it was being read to me much more slowly than I would have read it myself. I did like the way Dante and his family were presented; thought the book could have focused more on Dante! Ari definitely was dramatic, but he was also a teenager, so I figured it was part and parcel of his character. Interesting you didn't like the audiobook - I read it in audio, too, and really enjoyed it! But I read all audiobooks at 1.75-2X speed, so it was a pretty good pace for me. You have been secretive, but said enough to interest. I shouldn't add any more books-to-look-for but... And the cover is just beautiful! I was excited to see this post come up with all the excitement in the first paragraph. I added this to my TBR list I THINK when Rolling Stone released that list of really good YA novels? And I'd never heard of it before then. But it sounds wonderful. Sigh, this book. I keep seeing it everywhere, and think about picking it up. I need to just actually read it! Thank you for the reminder.